For the past few days, we have been doing a mini series on getting referrals. I’ve been enjoying sharing with you on how to get referrals, however, we are moving on after this one. We will be talking more in depth about referrals on the membership side of the site. Simply visit marketingforowners.com/join. Membership is free — and that’s where we give the really good stuff. So let’s get back to chatting about how to get referrals at every opportunity. This, again, is key. Remember on Friday, I gave you a weekend challenge to name your Top Ten Costumers . and going to visit them and actually asking them to refer you to their friends and colleagues. Now, this works so this is something you want to make part of your everyday business strategy. Opportunities are email signatures. Yes, they are usually unused. I hope you are not one of those people who do those long disclaimer email messages. It’s not necessary. Yes! A lawyer might have told you that you need that, but it’s not necessary. Get rid of it. Replace it with a marketing message or something about referring. Once you have sent an invoice to somebody, follow up with a question asking them how wonderful you are. How about the famous question from the Net Promoter Score? How likely would you be to refer me to your friends? It might be it from 1 to 10 with 10 being the most likely. Ask them specifically and then get in to a conversation and say, “Okay, so you think that we’re pretty good” because I assume that is what they are going to say and you know that you are very good so don’t be afraid to ask them. Would they actually refer you to a couple of friends or colleagues? Could they give you a name and a phone number right now because you will contact them, you will explain why you have contacted them. This won’t be a spammy sales call, because you will actually offer them a gift to just go and chat with them. The gift of course, will be worththeir while and if they do that, it will make them look great, that’s one way. How about in your email auto responder’s series when someone has purchased something (remember in our system– once it’s purchased you want to move them on to become the preacher). Joey Coleman promotes the first one hundred days as being the most important part of your relationship with your purchaser that’s where you forge their opinion of you and how are they going to deal with you, or if they are going to deal with you in the future and if they are going to recommend you. So work on them, make offers, give them something. We will use my fire safety business for example. If a customer buys a fire blanket or a fire safety sign, we put something in the box and we say thank you and we offer something to them to pass to a friend or colleague. It could be a discount or an introductory discount. It’s free obviously, other than having it printed. It’s free. It just goes in the box. It’s with the invoices, with the delivery note. They will not miss it. When our reps or when our service staff has any touch point with the customer, they are going to ask for a couple of referring notes where they have been given introductory discounts. You can also hand over a couple that they can give away to some of their friends as well. Make every opportunity a chance with a customer, someone who has just purchased from you. Don’t forget you’re not going to ask for referrals until they are a customer. But when you ask, you want to make them look good. You want to give them something so that they can give a special offer to their friend, to their colleague, to their family member. These are the basic principles of becoming a referable business that cuts their marketing costs in half because their customers do the referrals for them. It’s a wonderful thing. Please owners go try this. Today’s book this week is surprisingly by Richard Coche again. 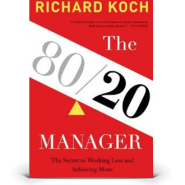 I think he’s got in once or twice before but this is the 80/20 Manager and yes, he’s right with the 80/20 but this is the 8/20 Manager. Now, this one is for you as the business center. What does this book teach you? It is going to teach you the correct principle where twenty percent of your efforts gets eighty percent of the results etc. This really does work. It takes a small portion of your work, and a giant proportion of your gains comes from a small portion of your customers or a small portion of your work. So all you need to do is figure out what is getting best results. What you’re doing that is producing the biggest result and doing that first. Stop doing the rest perhaps all together concentrating on the best result. It’s a great book. Richard Coche is a great author. I love his work and the best thing is he’s actually genuinely a successful investor, business person and is a great payist to boast about his investments. Go read that and then come back tomorrow. We will be on to some more great marketing tips. 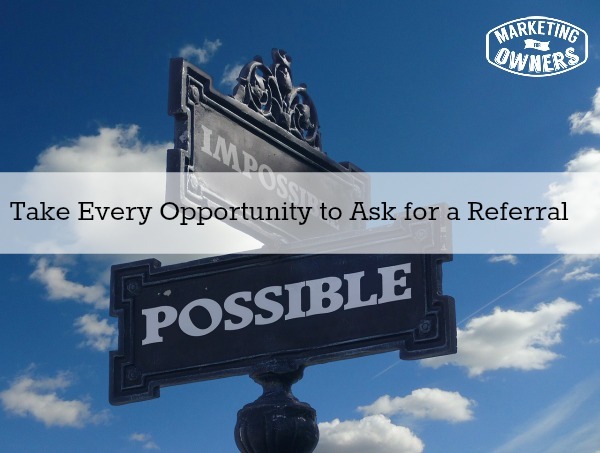 What opportunity are you missing out on for a new referral?